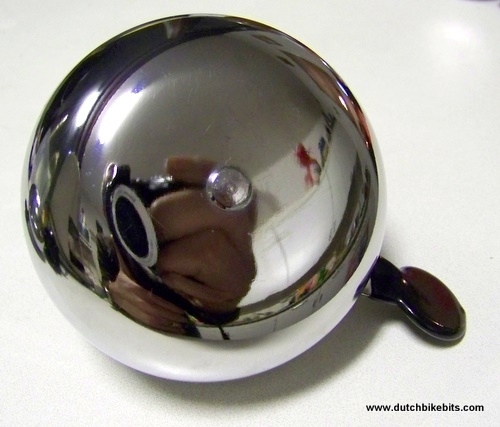 A chromed 80 mm round bell (significantly larger than a standard bell) with a distinctive "Ding Dong" sound which has an extraordinary sustain. The loudest bell that we tested, with 106 dBA at a one metre distance. 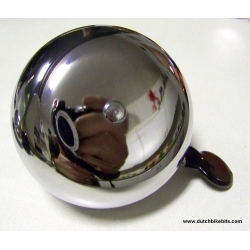 We used to supply the genuine Widek Ding Dong bell but unfortunately it is no longer available. We searched for some time for a suitable replacement and have found a copy which matches the Widek bell exactly. Unlike other copies of lesser quality, quieter, with less robust construction (plastic levers) or with less pleasant tone than the original, these are identical. We think they actually come from the same source. There's also an advantage in that these are a couple of euros less expensive. Also available with a painted flower finish.